edirect.ae – A Dubai Based Multi-Service Digital Design Agency Originally Established in 2001. We Are The Leading Digital Agency In Dubai. All Enquiries Are Welcome. Our award-winning digital marketing agency is now considered the go-to option by many. It’s our commitment to our clients that is the reason so many choose to recommend our services to their friends and associates. We have helped hundreds of businesses throughout the UK realise their full potential, and now we can do the same for companies based here in Dubai. Our team are experts at what they do, and their grasp of this ever-changing industry will ensure the success of our clients both on and off the Internet. With edirect by your side, you’ll have everything you need to reach new audiences, increase your turnover and solidify the future of your business. 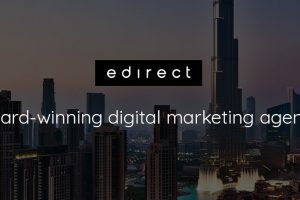 So, if you’re based in Dubai and are looking to enlist the services of a reputable digital marketing agency, look no further than edirect. We Offer Unique Promotional Offers Throughout The Year. "Call Our Sales Team To Find Out What Offers Are Currently Available."